FRANKLIN, Mass. – For the third year in a row, Franklin and Xaverian met in the Div. 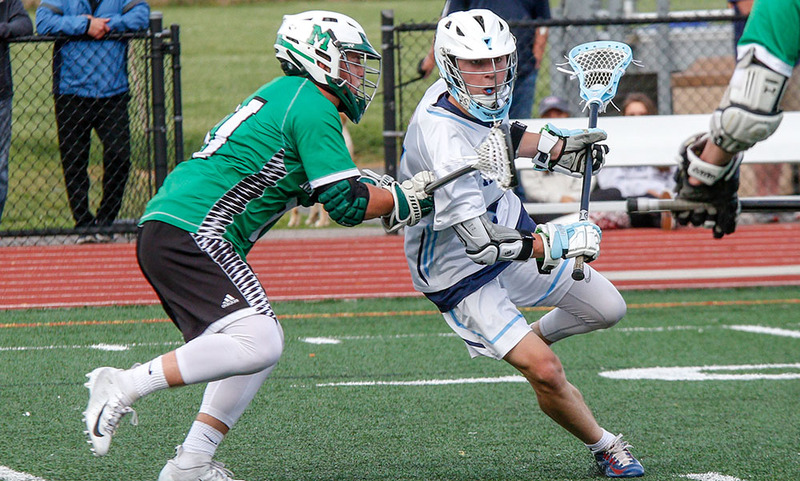 1 South tournament but for the first time in this budding rivalry the Panthers entered Sunday evening’s game at Pisini Field as the favorite against the perennial power. Despite the Hawks entering the playoffs with an 8-10 record, Franklin was not taking the Catholic Conference runner-up lightly knowing the pedigree of its opponent and the fact many of the players are also neighbors.. In fact, Franklin coach Lou Verrochi thought that his team may have been too fired up before the playoff opener. 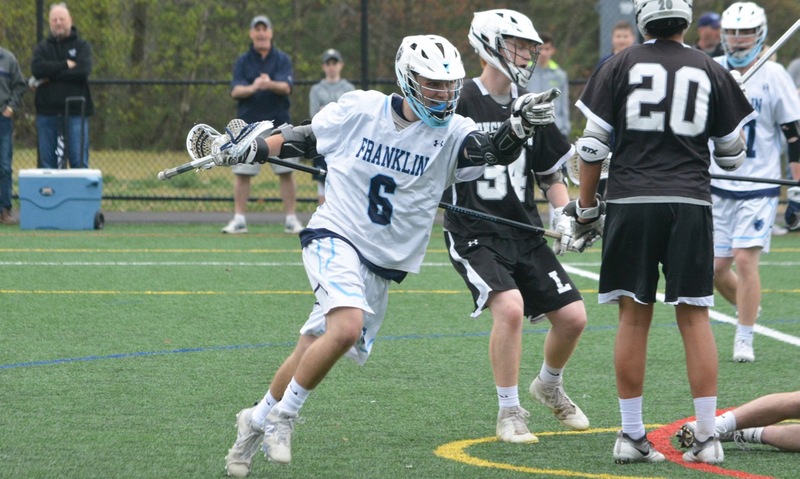 Franklin struggled offensively against the Hawks, going scoreless for more than 16 minutes between the second and fourth quarters, and saw a furious fourth quarter rally run out of time in an 8-7 loss. 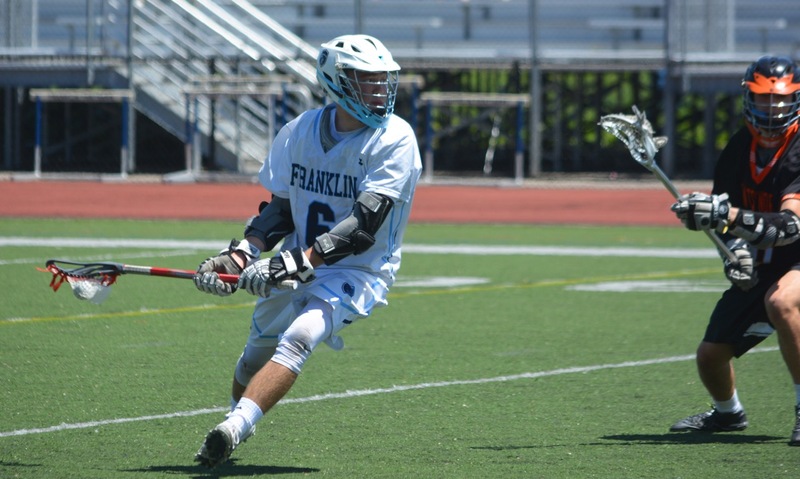 Junior Eric Civetti led the way for Franklin with four goals, all of them in the fourth, but for large portions of the game he struggled to find space against senior Connor Sullivan. The Panthers jumped out to an early lead three minutes in. Sullivan knocked the stick and ball out of Civetti’s hands but Nitin Chaudhury reacted first, scooped the loose ball, and dodged from the ‘X’ before finishing with a wrap around shot just under the bar. Xaverian scored the next two goals to take its first lead of the night, but Franklin answered with 5:04 left in the first to tie the game at 2-2. Kyle McEniry fired a pass from behind the goal to a cutting Sam Arsenault and he fired a low angle shot from behind his marker that found the corner. 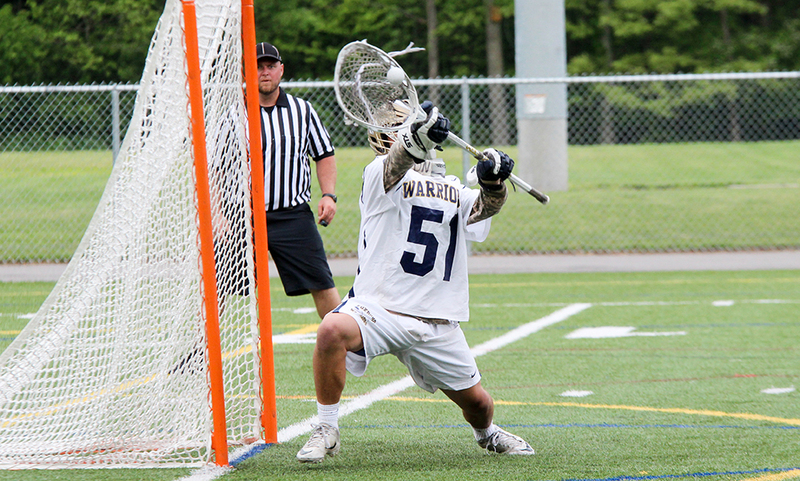 Sophomore FOGO Jacob Alexander was struggling in the first, being called for two false starts, and Xaverian took advantage to regain the lead at 3-2 on a left-handed finish by Jared Grier. Alexander would win 4-of-7 face-offs in the first quarter, but went on to lose only one more for the rest of the game (the only lost face-off on a disputed false start in the fourth). The Panthers created chances in the second quarter, but were frequently stymied by freshman goalie Alexander Teagan, who made eight saves on the game, most of them on point-blank chances. Franklin goalie Connor O’Rourke was equally impressive with 10 saves on the night to keep the Panthers in it while the offense tried to find a rhythm. Sam Jean scored the first of three goals on the night for the Hawks to build a 5-2 lead, but Chase Tanner unleashed a laser into the top corner six minutes later to cut the Xaverian lead to 5-3. Alexander won the ensuing face-off and raced straight down the middle only for Teagan to stuff him at the end and then O’Rourke came through with a big save to rob Andrew Lee right before halftime. At the break, Franklin assistant coach Fran Bositis tried to stir the Panthers, who had allowed Xaverian to control the tempo in the first half, but the halftime team talk did not seem to have much effect in the third quarter. The Panthers went scoreless for the full 12 minutes and Grier and Jean (with just one second on the clock) pushed the Hawks lead to 7-3. Trailing by four goals, Franklin turned to Civetti to try and bring the Panthers back into the game. He finally found the breakthrough two minutes into the fourth, ending Franklin’s barren run, with a long-angle release after bullying Sullivan into a shooting position. O’Rourke robbed Lee again two minutes later and Civetti made it count with a ridiculous finish. The Rutgers-commit backed into his marker on the left side of the goal and rather than turn to his stronger right side he fired a backhanded, practically underhand shot into the top corner. The Franklin bench was fired up and momentum seemed to be with the hosts. Civetti took that energy up another notch 20 seconds later when he dodged from the ‘X’ to the left and fired a backhanded shot around the shoulder of his marker on the run and again picked the corner. The finish had the Franklin bench going crazy, but Xaverian got possession back and set out to run the clock. Jean scored a crucial goal with 1:40 remaining to regain the two-goal lead and Franklin could not take advantage of a man-up opportunity in the final minute. Civetti tacked on a consolation goal in the final second (another impressive behind the back finish), but it was the visiting bench that was able to storm the field and celebrate the win. 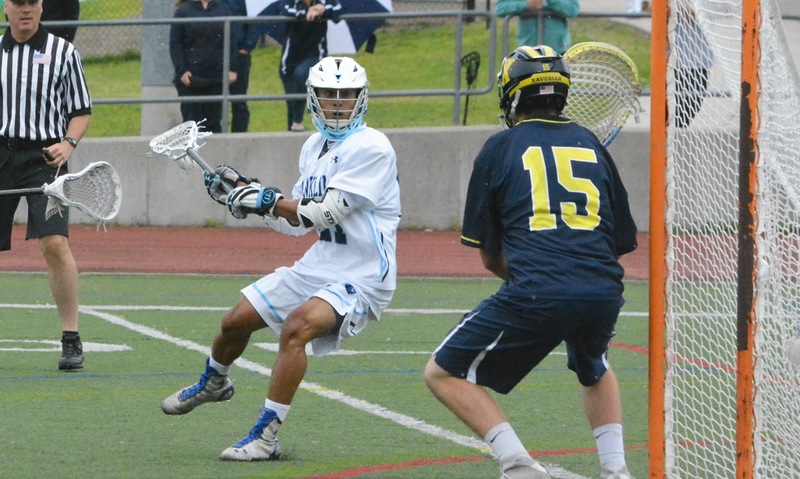 It was the fifth one-goal loss of the season for Franklin (16-5), all of them to teams that are currently alive in the tournament and three of them to teams that earned top seeds in their respective brackets (BC High, Dover-Sherborn, and Walpole).